I am really getting the hang of all these challenges. It is something that I look forward to every week now. Sometimes I surprise myself that I can make my card fit more than one challenge. Such is the case for this card. I am entering this not only to one, nor two but three challenges. Talk about being efficient, ha! Here is my card. I used Papertrey stamp (celebrations), die (modern alphabet, wonderful words, framed out), impression plate (woodgrain), cardstock (smokey shadow, true black, spring moss, aqua mist, hawaiian shores), patterned paper (bitty dot pure poppy) and ink (fresh snow). Wow, this is a 100% Papertrey card! - One of Papertrey’s Anniversary contests where we were asked to create a project inspired by one of the Design Team's favourite projects. I chose Danielle Flanders' XOXO card. I love the dark background and the gradient of colour in this card. - Next is at CAS-ual Fridays. The challenge is to use letters creatively in our CAS project. I used my different die cut letters to create the focal point of the card. - And lastly, I am entering this to Passion for Papertrey’s Love is in the Air challenge. The project does not have to be for Valentines but should be love-themed. I made this card for my Dad’s birthday. His birthday is not until October but I want to make my cards in advance, lol. Thanks for stopping by and hope you are having a fabulous week! Oh, I love this! The woodgrain embossing is the perfect addition to your card! Your card is fantastic, Irma! I love how you used the woodgrain IP on part of the card! What fantastic cards. So bright and cheery. Irma, this rocks!!! I love what you did with your IP and the colors are fabulous! Thanks for playing along with us at CAS-ual Fridays! What an awesome card! 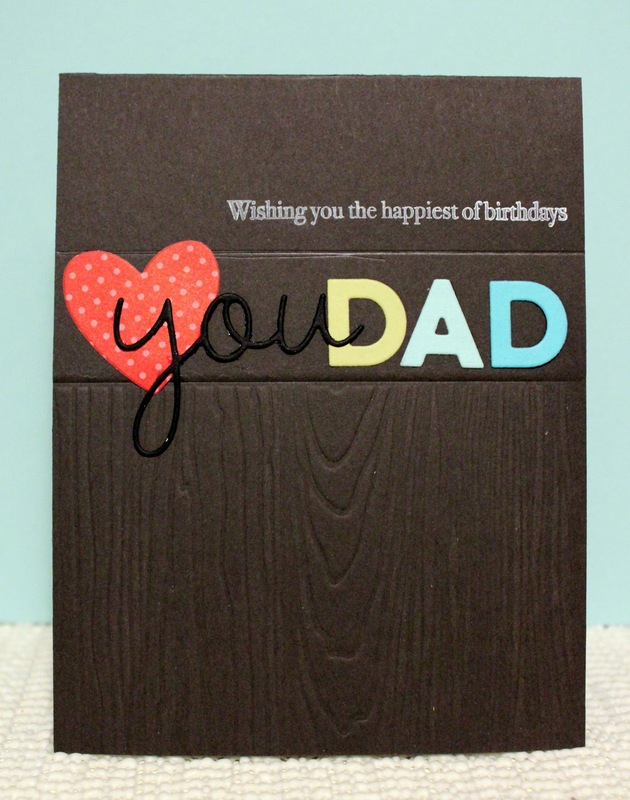 I love the way you used the letters here and the woodgrain on chocolate is so perfect for dad! Love it! Thanks so much for playing along with us at CAS-ual Fridays this week! Beautiful interpretation! I love the heart with the die cut letters. Gorgeous! I love the dark background, the woodgrain, and those bright colours! Gorgeous! Love your take on Danielle's inspiration! So fun! You are more than just getting the hang of the challenges...CONGRATS on making the list of Contenders over CAS-ual Fridays, Irma! What a GORGEOUS-looking card! Absolutely love it!